1. My daughter2 is graduating from university this month and plans to teach elementary school. What are three qualities you most want to see evidenced in a teacher? 2. You can tell a lot about a person by____________________. 3. What song makes you think spring? Oh, this is going way back but when I read this question I immediately thought of "Everything's Coming Up Roses." And, that song has nothing to do with spring but the question wasn't about what song has something to do with spring. ~smile~ I like the happy rhythm of the song, thus the reason it reminds me of spring. 4. May 1st is Mother Goose Day...share your favorite nursery rhyme. 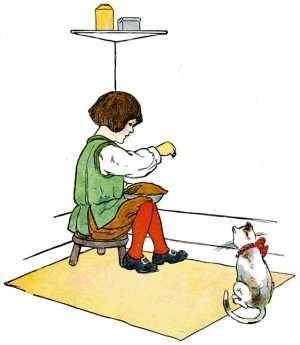 Oh, how can I pick just one.........I have always loved Little Jack Horner because of the "pulling out his thumb." I know, so silly, but I always like it as a child. 5. What makes someone unforgettable? The way they make you feel. Some folks have such a way of making a person feel so important and special and they engage you in the conversation. They remember it is not "all about them." 6. Should music and/or art be part of a well rounded education? 7. What social situations make you flustered or nervous? It is rare for me to feel flustered or nervous in social situations. But if I happen to be among more strangers than acquaintances or friends then I'm not as comfortable. When we moved my Daddy from the nursing home on Monday it meant saying good bye to some very special folks. One such person was Amber. 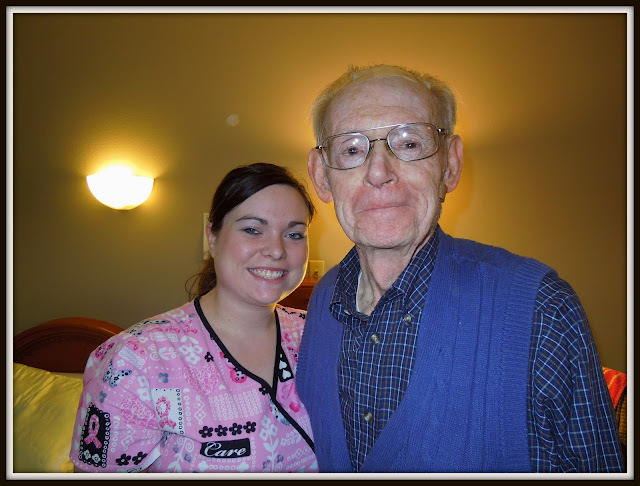 Amber came to work at the nursing home as an aide the day my Dad was admitted and he was her very first patient. Amber has been with him ever since. Other aides on his hall have come and gone but Amber was his constant. Never did I one time see her display anything but a sweet spirit and a sweet smile. And, my Daddy was very, very needy when he arrived at the home and remained that way for about 4 months. I am sure there were days that she was in his room tending to something he needed every 20-30 minutes. Can I just tell you that I got very emotional when we said our goodbyes Monday morning. Amber has been God's special angel to us and we will always love her for that. Thanks Joyce for another fun Hodgepodge! You always "show up" for us girlies and we love you for it. Good morning! You had answers very similiar to mine, and yet you said it soo much briefer, haha....I do tend to ramble on. So glad you got your dad settled into his new place. Hope you have a good day! That picture of your daddy is so sweet. I can only imagine how difficult it was to tell the folks who cared for him "goodbye". They become like family, don't they? Hoping and praying your daddy adjusts well to his new home. I love your answers to #1 and, especially, to #5...that is so very true! Happy Wednesday! There should be more AMBERS in the world. Your Daddy looks great. I hope he is adjusting to his new home. Great answers, Lea! Amber is obviously a very special young woman. "The way people make you feel." This is so true. I think my shyness has hindered me some in making others feel good, but God has helped me with it, and I'm learning to make it about the other person. Growing up my mother always told me to talk about the other person. This was her attempt to help me because I was so quiet, self conscious, and flustered with conversation. God has brought me a long way! A wonderful caring caregiver can make a huge difference in a persons recovery. So glad your father had Amber. Great answers on the Hodgepodge! Enjoy the rest of your week. How special that aide was! Such a blessing to find people who truly care and tend to our loved ones. i love to see your dad! i see where you get your good jeans from. : ) what a bittersweet transition. hope it is going well for each of you. and you flustered or nervous in a social situation?? highly doubtful! you are the most warm and welcoming dear heart i have ever met!! !